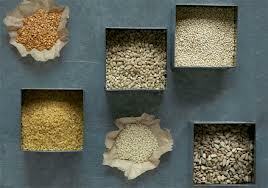 The research has been in and confirmed for awhile: whole grains are better for us than white or refined grains! More vitamins and minerals including selenium, vitamin E and magnesium. More phytochemicals, which wage war against disease-causing free radicals. A lower glycemic index, which reduces blood sugar spikes and, hence, diabetes risk. So what kind of whole grains are out there (besides whole wheat bread ; )? I want to give booty camp two options that I’ve been trying and enjoying. 1. Quinoa! We go through this like crazy and use it as a substitute for rice, so we purchase it from Costco. We also use it in salads and as a side dish. Try mixing with feta cheese & cranberries, or other spices. Gluten-free! In The Kitchen: Quinoa has a nutty, palate-pleasing taste and cooks up in only 10 to 15 minutes. Much faster than brown rice. Use a 2:1 water to grain ratio and take it off the heat when the water has soaked in and the germ unfolds like a little white tail. To intensify the flavor, try toasting quinoa in a skillet for a couple minutes over medium heat till darkened prior to boiling and add spices such as turmeric or chili powder to the cooking water. It is also best to rinse quinoa well before cooking to remove any remnants of a bitter coating called saponin. 2. Buckwheat! This is a gluten-free option, and contains a good amount of the amino acid lysine, which makes it a fairly complete protein source and helps repair & rebuild our lean muscle mass. In the Kitchen: With a 15 minute simmer time, buckwheat is quick-cooking and versatile. It can be used in pilafs, salads, stuffings, stir fries and soups or in replace of a portion of meat in burgers and meatloaf. If you find the taste a little too overpowering on its own, try mixing some buckwheat in with other grains like rice or quinoa when serving as a side dish. On the stovetop, add one cup of buckwheat to two cups of boiling water, cover, reduce heat and simmer for roughly 15 minutes. Next postAn Anti-Inflammatory Chef Amongst Us!